A look at the challenges of designing and constructing a 50-ft.-dia. 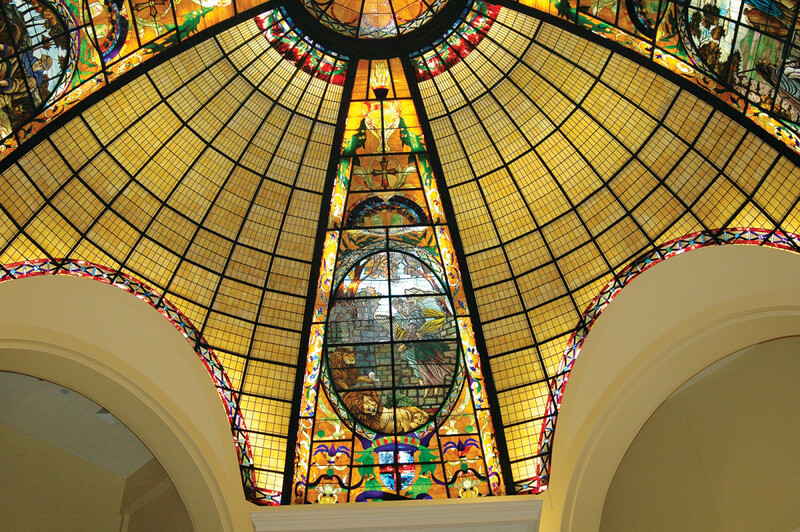 stained-glass dome in a new church in Arkansas. 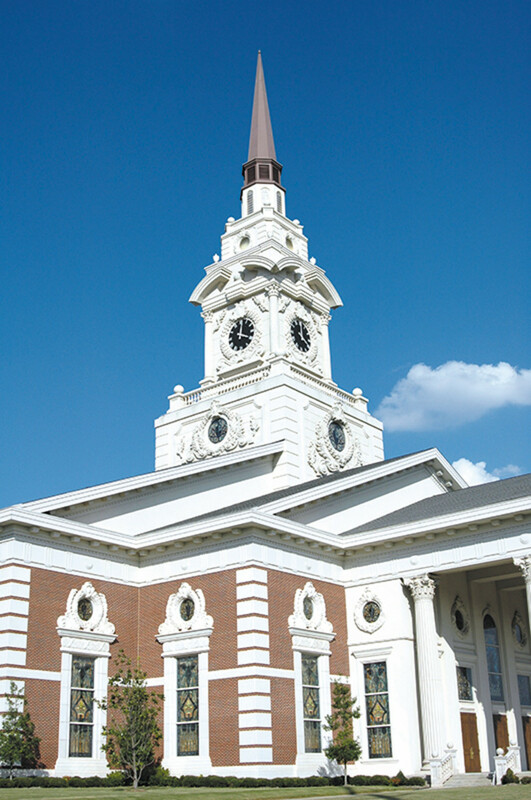 The First Pentecostal Church, a grand Beaux Arts-style building, was designed by Michael Hahn & Associates of Little Rock in 1992 to replace a smaller building that the congregation had outgrown. The dome is not visible from the exterior; it is beneath the tower. The First Pentecostal Church of Jesus Christ, located in North Little Rock, AR, used a small building with an intimate worship space until 1992, when local architect Michael Hahn & Associates designed a new building to accommodate a growing congregation. The old church was adapted for offices. 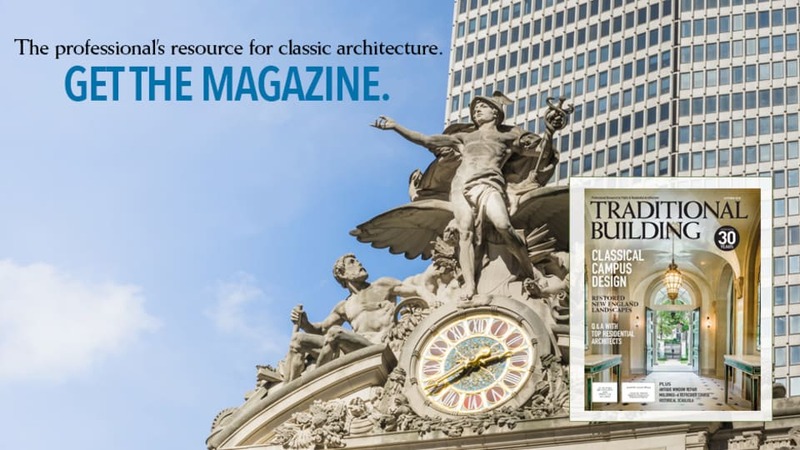 Hahn’s building is in the Beaux Arts style and features fluted Corinthian columns, a portico and a wealth of terra-cotta ornament. 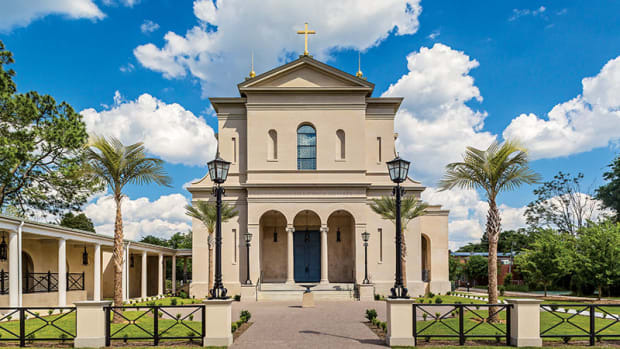 The crowning feature of the new church is found in the narthex: a 50-ft.-dia. dome constructed of 2,400 sq.ft. of stained glass. The design, fabrication and installation of the dome were overseen by IHS Studios, Inc., of Fredericksburg, TX. 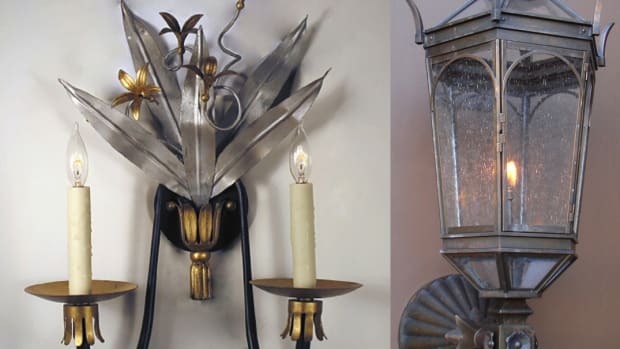 Discussions with the clients began in 1999 and in April 2000 IHS began the design process. 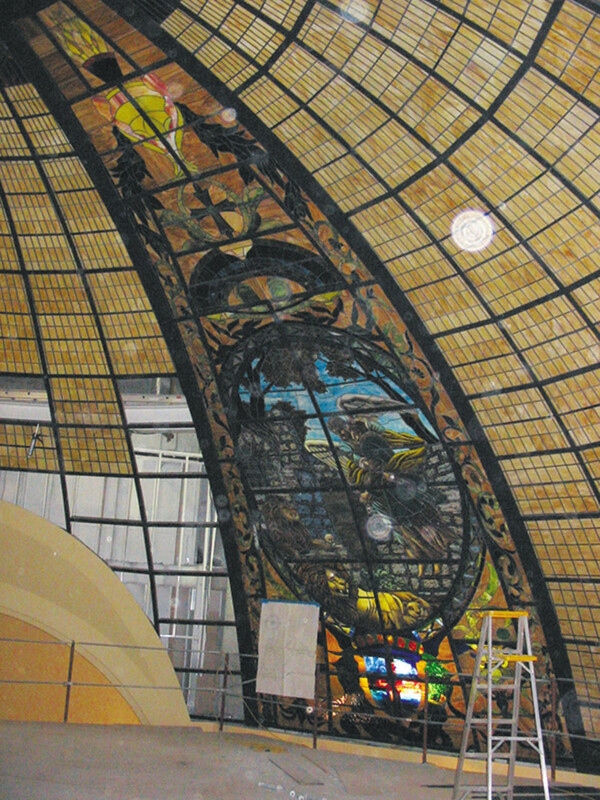 “The church’s pastor was interested in emulating the traditional dome found in the town’s city hall,” says Dennis Roberts, artist and owner of IHS. 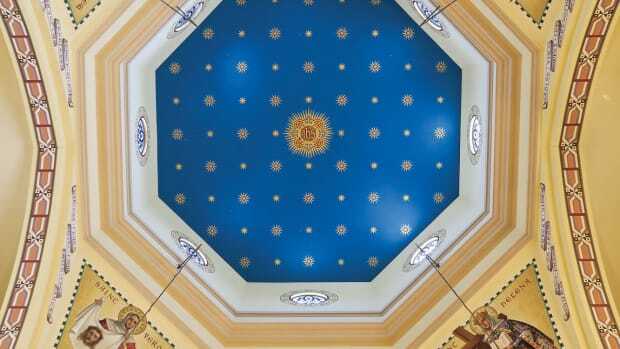 “He envisioned a 1920s geometric design with some Victorian elements.” IHS studied and sketched city hall’s dome and worked to adapt it for the church’s purposes and physical space. “We did many color sketches and poured over many glass samples before the client was comfortable with it,” says Roberts. IHS Studios, Inc., of Fredericksburg, TX, designed about 6,900 sq.ft. of stained glass for the First Pentecostal Church of Jesus Christ in North Little Rock, AR. This included a 50-ft.-dia. dome that was built 60 ft. above the floor and rose to about 95 ft. high. All photos: courtesy of IHS Studios, Inc.
After about nine months of creating preliminary drawings, IHS and the client settled on a design. 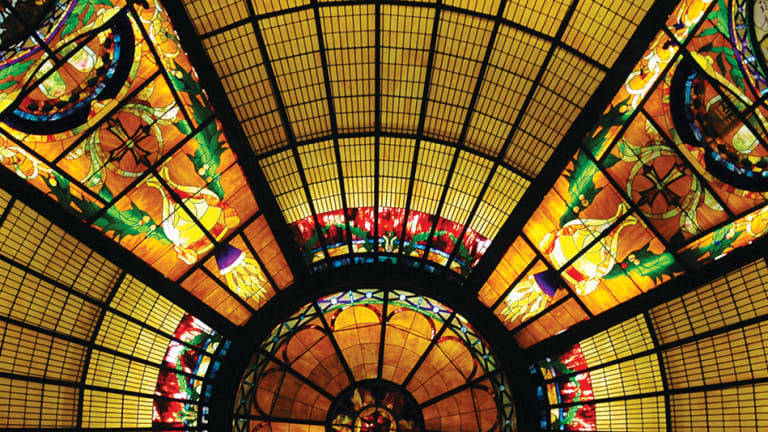 The dome, which is divided into four quadrants, was to feature a rectangular pattern in opalescent amber-and-white-mixed glass in two-thirds of each quadrant and 8x12-ft. ovals with decorative borders in the remainder of each quadrant. 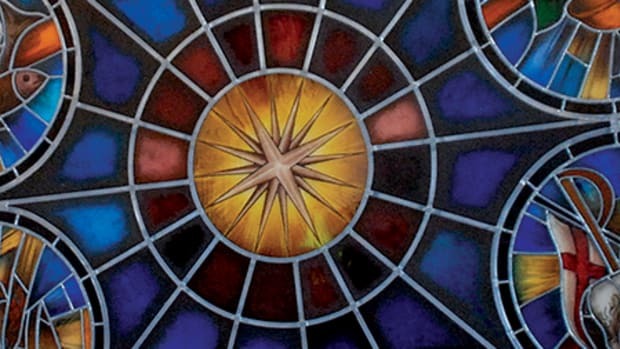 There would be a different biblical scene depicted in each of the hand-painted stained-glass ovals: Daniel in the lion’s den, Samaritan woman at the well, Good Samaritan, and Moses and the Ten Commandments. An engineer with Hahn Associates designed the dome framing. Steel I-beams were bent to the engineered radius and then welded in place. 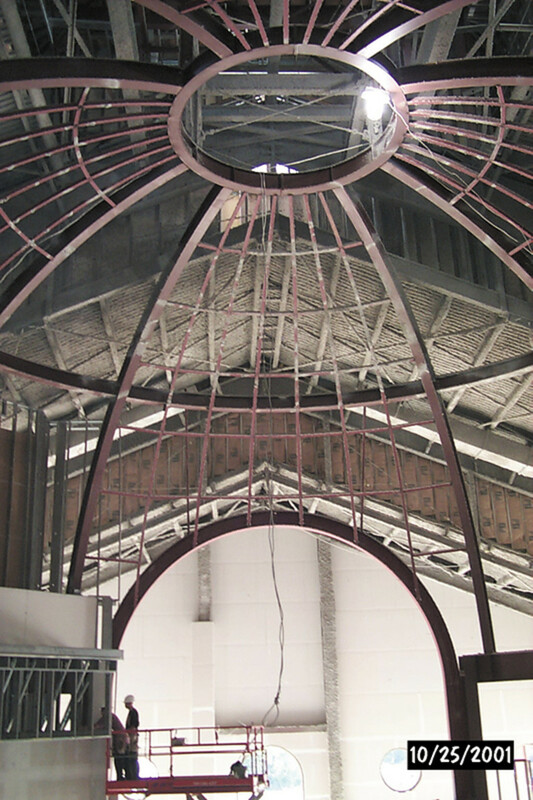 In preparation for the fabrication of the stained glass, an engineer with Hahn Associates designed the dome framing. Steel I-beams were bent to the engineered radius and then welded in place. “He did everything expertly without even glancing at a drawing of what the dome should look like when doing the vertical sides of each panel,” says Roberts. Measurements of each of the templates were transferred into CAD. “We digitized the templates into a CAD file and printed the blanks to confirm that they were true to the templates,” says David Roberts. “This was required because of the difficulties involved in drawing parallelograms in CAD.” Next, IHS made adjustments to each panel in CAD so that they would fit the corresponding opening in the other three quadrants. This provided a full-size drawing of the entire dome. To install the stained glass, a scaffold deck and pulley system was built at the 60-ft. mark and the panels were hoisted up on custom-built dollies. They were then lifted in from underneath the dome through a 4x8-ft. hole in the scaffold deck. A geometric pattern was designed for the center and for two-thirds of each of the four quadrants of the dome. Ovals with decorative borders are in the remainder of each quadrant. IHS used both opalescent and ripple glass in the design to give the appearance of a 1920s style. 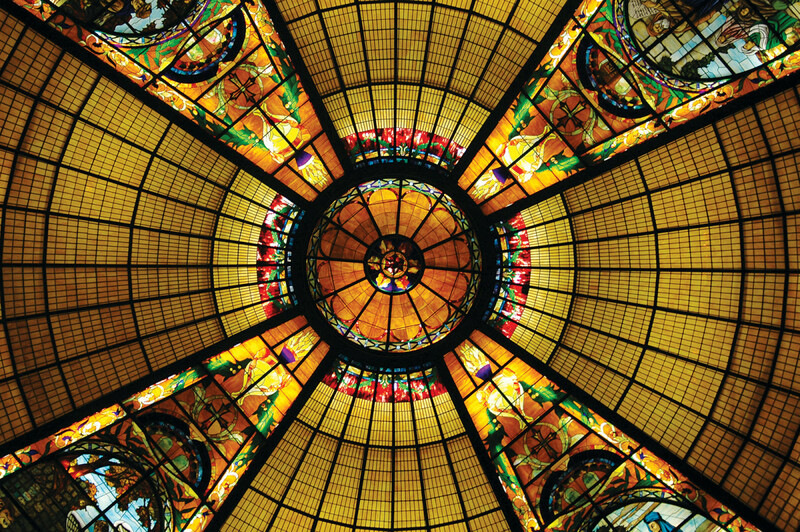 The ribbon of color hugging the arches draws one’s eye around the base of the dome, while the 30-ft.-tall vertical pictorial and flourishes lead one to look up. 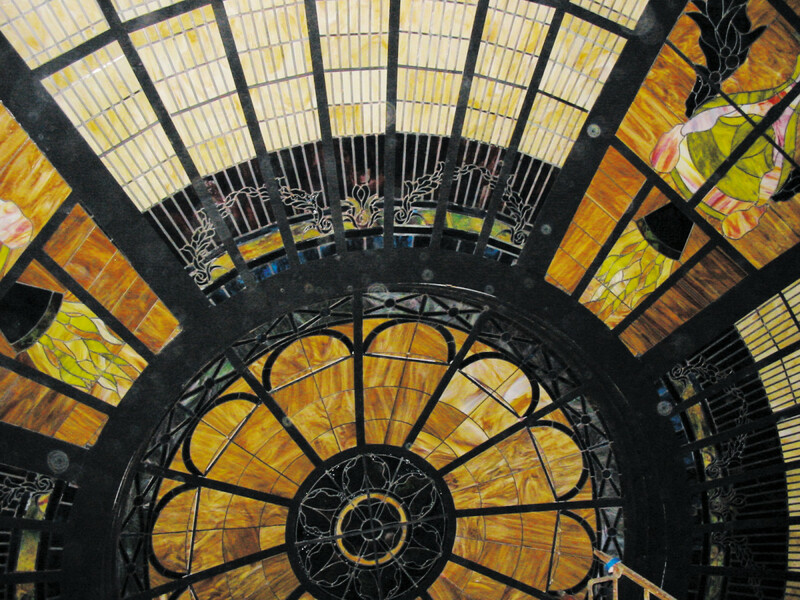 The stained-glass panels were hoisted up on custom-built dollies and lifted in from underneath the dome through a 4x8-ft. hole in the scaffold deck. A T-bar was wire tied to each panel for additional support and the top of the T-bar was attached to the steel. “The bottom of the T-bar keeps the glass panel from bending or sagging,” explains David Roberts. The glass itself was fabricated 3/16 of an inch smaller than its CAD-determined measurements for ease of installation. “At just a little bit smaller than required, the glass is allowed installation clearance and room to expand,” says David Roberts. IHS worked from the top down, but left the center of the dome for the end. The installation took about three weeks with five people on hand. In context, the dome appears grand and majestic. Tall arches and fluted Corinthian columns hold it up. The dome is enclosed – hidden on the exterior by a square tower – so Hahn Associates installed backlighting to illuminate it. Natural light streams in from the tower’s four small windows. To keep the glass clean, a central vacuum system was installed. 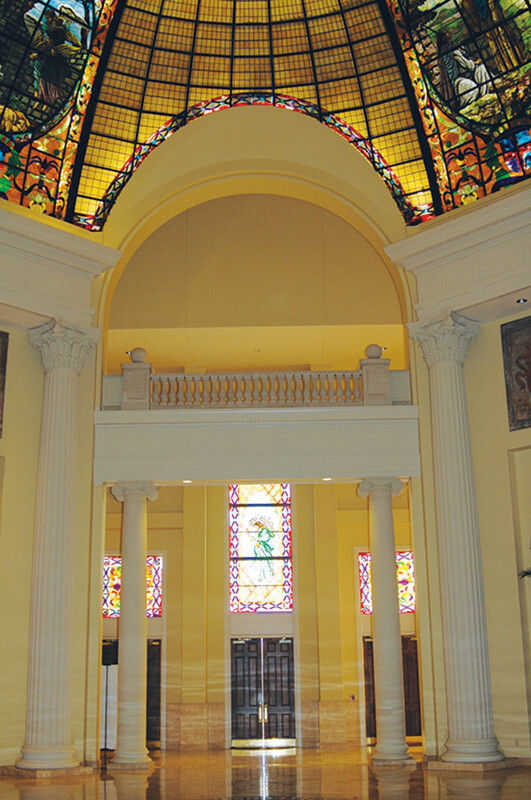 In addition to the dome, IHS fabricated 70 stained-glass windows for the church. “The windows were approximately another 4,500 sq.ft. of glass,” says Dennis Roberts. The entire project took 2½ years of on-and-off work. It was finished in November 2003, but IHS wasn’t quite finished. “After the dome was installed, we got a call that a 2x4 had fallen through one of the panels,” say Dennis Roberts. “We no longer had scaffolding up, so we used a permanent catwalk that had been built above the dome. We laid some boards above the panel, lifted the glass out from above and replaced it.” Now the dome is truly complete.